All organisers are not alike! Each elicits different types of thinking (comparative, inductive or deductive thinking, evaluative thinking or simple classification and identification). Organisers also promote processing to different degrees. Some guide learners to explicitly develop depth, others breadth, some both and some neither. All of this occurs through the framing of the tool. It’s not just about infusing thinking tools in our practice…it’s about the strategic selection of the right tool at the right time; it’s about sequencing or layering thinking tools so that learning is advanced only because of their use. It’s about understanding tools that facilitate the same learning job; and recognizing those that address the job in a way that could not be accomplished with any other tool. It’s about understanding what it means to develop breadth of knowledge and understanding versus depth; and then selecting, sequencing and framing thinking tools in accordance to a learner’s individual cognitive capacity. Finally, and most importantly, it’s about transferring this knowledge and these skills from the teacher’s realm of control to that of the learners. 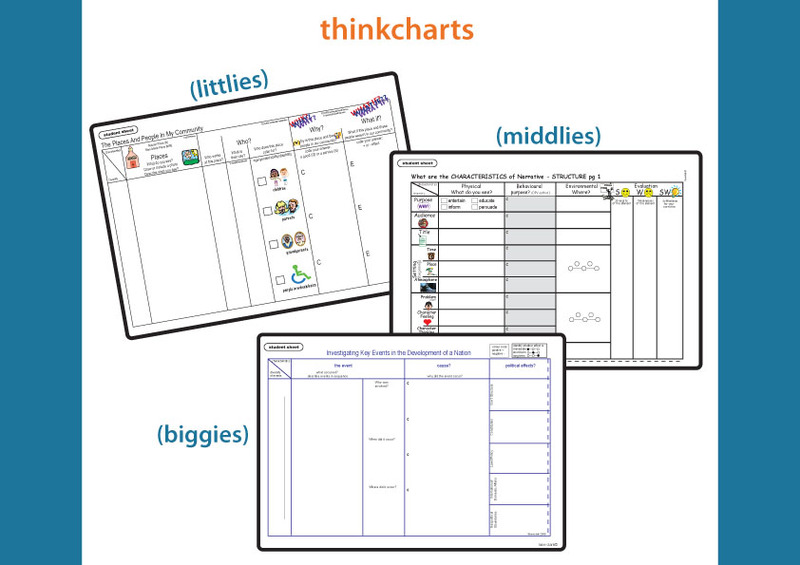 The thinkchart™ organiser is a strategically designed tool to guide learners in the investigation of new information. click here [download id=”15″] The tool has been framed to ensure that rigor is deliberately accessed, but as importantly, that the rigor is deliberately processed by the learner at pre-determined degrees of depth and breadth. The thinkchart™ explicitly outlines the schema associated with the learning. Only the schema that is required is framed into the design of the organiser. As a result, both intrinsic and extraneous cognitive loads are reduced. It also directs learners to deliberately and strategically process the schema at a level commensurate with their ability. Differentiation is addressed through the strategic framing of the behavioural section of this tool. No learner is stretched beyond his limit but neither is he limited. There is always the option to complete more or less of the organizer. The S.W.SW™ sections (strength.weakness.so what ideas) of the thinkchart™, engage learners in an analysis and evaluation of their learning. Learners become both cognitively and emotionally engaged in the learning they are doing. Germame investment is promoted as learners develop ideas for how they will USE their learning to make a difference in their life and the lives of others™. Learners are encouraged to record on their organiser using a method of their choice. They may write, use images and / or record their discoveries and thinking by inserting a voice recording on a digital organiser. The provision of these options is critical if extraneous overload is to be avoided. For more information on this tool please access the digital presentation entitled, about thinkchart and explore the examples that have been provided for your reference.